Just when we thought we had seen it all, Rihanna stunned us again. 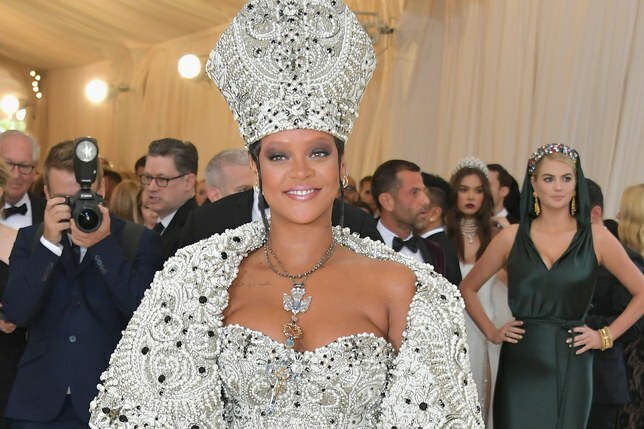 Rihanna’s papal ensemble at the MET gala left social media exploding with a trinity of reactions. The Gammy award winning singer, burgeoning actress, ultra-generous philanthropist, makeup mogul and soon to be lingerie designer left mouths wide open with all the attention on her. She pulled a stunt that really overshadowed the whole event. The unofficial MET gala queen took the theme quite seriously and that’s why she arrived at the ‘Heavenly Bodies: Fashion and the Catholic Imagination’ exhibit opening dressed like an actual pope. The papal ensemble featured a tall beaded head dress, embroidered strapless mini dress and long show stopping overcoat.